New Mecalac Dumper 1000kg elevating forward tip hydrostatic £ Price on application A skip payload of 1000kg, maximum machine width of 1.1m and best in class turning circle of 4.6m the TA1EH is perfect for the smallest of worksites. 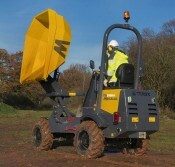 This new dumper is available now from SM Plant Limited, along with other new Mecalac plant. New Mecalac Dumper 2000kg straight tip hydrostatic £ Price on application With a skip payload of 2000kg, a straight tip skip, hydrostatic transmission, and simple user friendly controls. New Mecalac Dumper 2000kg 180 degree power swivel tip hydrostatic £ Price on application With a skip payload of 2000kg, a 180 degree power swivel tip skip, hydrostatic transmission, and simple user friendly controls. New Mecalac Dumper 2000kg elevating swivel tip hydrostatic £ Price on application With a skip payload of 2000kg, an elevating swivel tip skip, hydrostatic transmission, and simple user friendly controls. New Mecalac Dumper 3000kg forward tip manual £ Price on application Designed for the small to medium job site the TA3 offers versatility for your material movement.